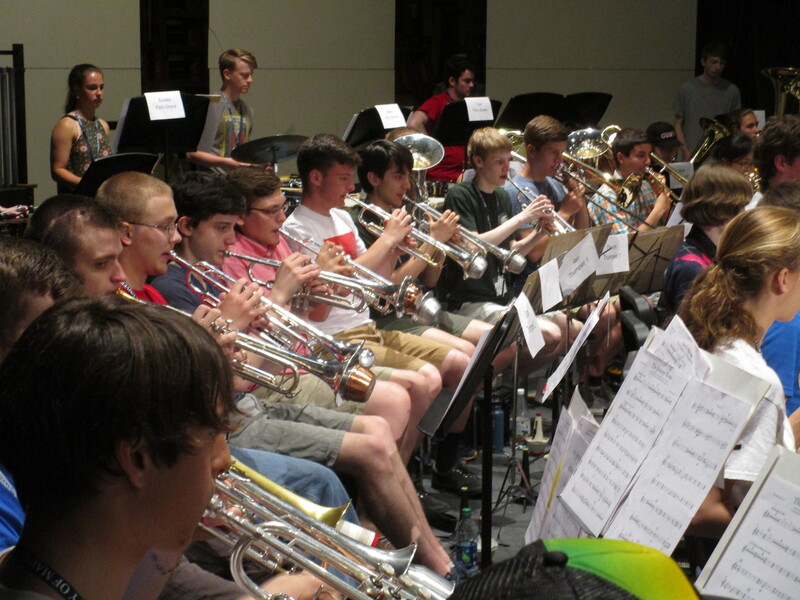 READ about it in today’s Portland Press Herald – Maine high school jazz fest red hot and cool! 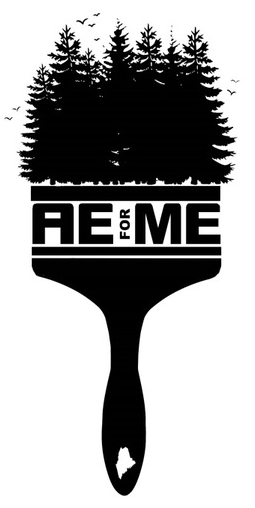 The annual Maine Art Education Association (MAEA) Spring Conference is just around the corner and they are looking for presenters. Saturday, 6 April, Belfast Area High School is hosting. Interested in presenting? CLICK HERE and complete the form. Wondering what workshops were included in 2018? CLICK HERE. 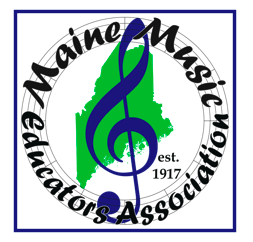 The Maine Music Educators Association is hosting their annual conference on May 16 and 17. If you are interested in presenting please submit your proposal by CLICKING HERE. 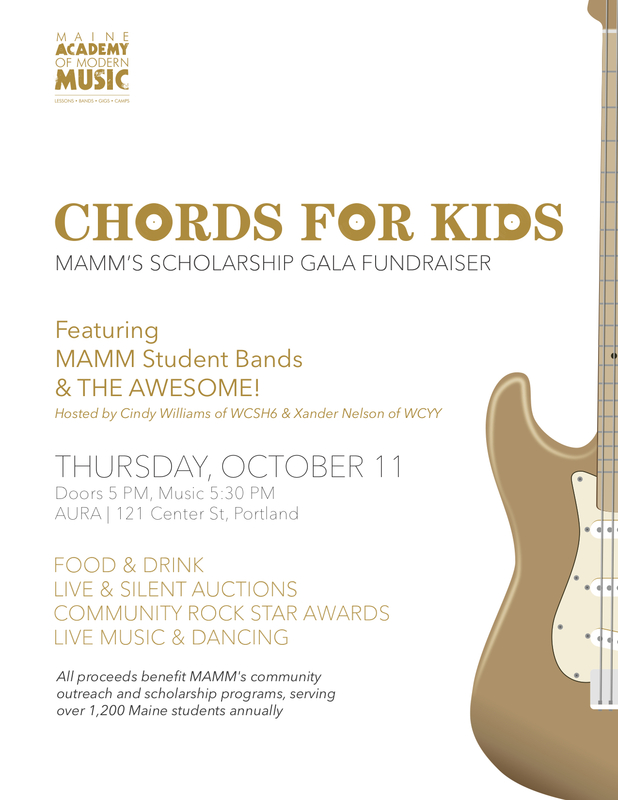 The Maine Academy of Modern Music (MAMM) is excited to invite Maine music teachers to attend Chords For Kids: MAMM’s Scholarship Gala Fundraiser, Oct 11 AURA for FREE! Teachers just need to produce their school credentials at the door and they and a guest may join us in our celebration that evening. The event will be a celebration of MAMM’s 11th anniversary and will feature performances by MAMM students, a silent auction, and an award ceremony where MAMM will recognize “Rock Stars in Our Communities”. Following the award ceremony attendees will dance the night away to Maine’s premiere 80’s band, The Awesome. 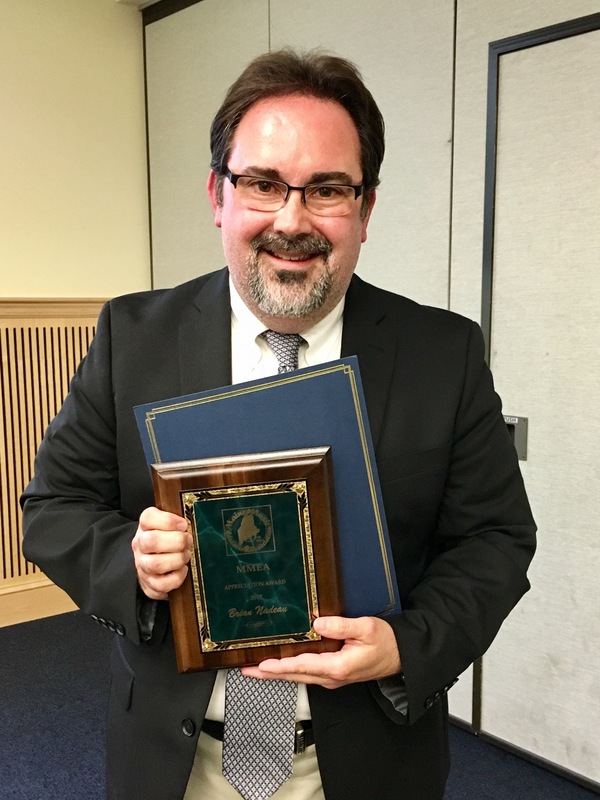 MAMM’s 2018 Maine Music Educator Award will go to Allen Thomas, Choir Director at Bonny Eagle High School and Chairperson of the District One Maine Music Educators Association. 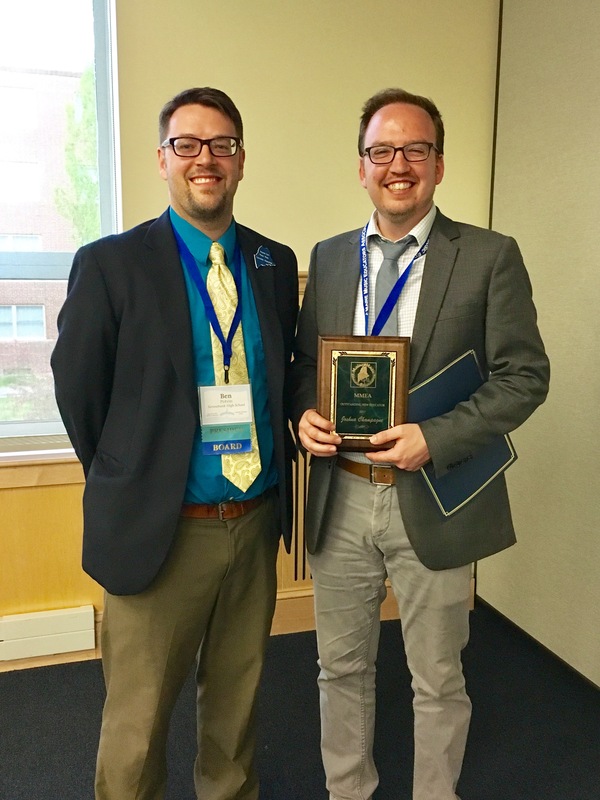 Thomas was selected from an impressive pool of candidates from across Maine because his work exemplifies MAMM’s mission of building leadership through the musical arts. “We were most impressed by Allen’s real efforts to cultivate leadership skills in his students and empower them to take charge of their craft and music performances,” said MAMM director Jeff Shaw. To learn more about MAMM visit www.maineacademyofmodernmusic.org. The following students will be representing Maine in the All-National Ensembles in Orlando, Florida, November 26-29. Thank you to the music educators who have helped prepare these students on their musical journeys! 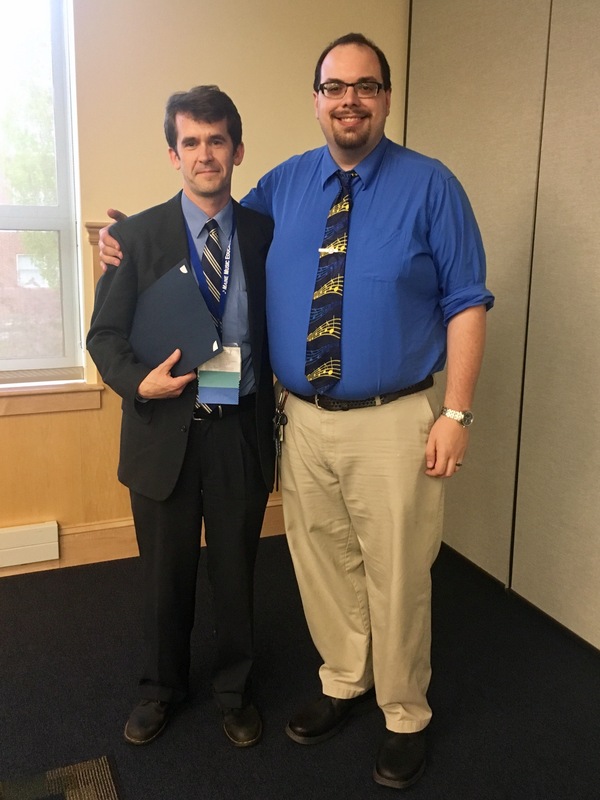 Congratulations to the following Maine Music Educators who received awards last week during the Maine Music Educators Association annual conference at UMaine Orono. Friday, September 30, 2016, 9 AM – 3:30 PM at Le Club Calumet – Augusta, ME (334 West River Road Augusta). Credit: 1.5 CEUs from the University of Southern Maine with a paper and lesson plan ($12. charge must be sent to USM at a later date – info at workshop). For a registration form or more information please contact Nancy Cash-Cobb mainemmeagmpk5vp@gmail.com or call her at 446-1762, Windham Primary Sch00l. Learn about this internationally-renowned approach to teaching students of all ages in a child-developmental approach of learning music through the human voice, movement, sight-reading, and comprehensive musical understanding. The process of learning is key, with careful preparation, presentation, and practice of all elements, concepts and skills. Covered will be choice of musical materials, sequencing, tools of Kodály teaching (hand signs, solfa, rhythm syllables, letter names), and learning a variety of classroom tested, successful song material. Successful learning of a wide variety of song material is critical for the success of the general music classroom at all grade levels. Learn 13 ways of teaching songs that intrigue students, keep them focused, and offer variety to the routines of teaching songs. Songs presented will be time-tested, successful songs useful in a variety of elementary grades. Developing part-singing skills takes time and careful sequencing for children to gain confidence, ability, and proficiency. This workshop examines part-work development in a successful sequence of learning. It will include a variety of part music suitable for young voices, including rounds, canons, partner songs, part songs, and folk song arrangements. This session will outline how to build a movement foundation for your students. Education Through Movement is a process that has analyzed locomotor and non-locomotor movements, which helps the teacher start with what is easiest and progress into more challenging movement sequences that are used in simple folk dances. Topics will include ways of engaging learners to move creatively, the prerequisites to teaching dance, and then practical application to some actual folk dances. Wear comfortable shoes and expect to have some fun! Jonathan C. Rappaport is Executive Director of Arts|Learning (Medfield, MA), a statewide non-profit organization that advocates for and promotes arts education and systemic education reform, and the Co-Founder/Director emeritus of the Kodály Music Institute, Southborough, MA, (founded 1998) where he teaches conducting and advanced pedagogy and materials analysis. He was formerly Head of School, Conservatory Lab Charter School (Brighton, MA), and the Performing Arts Liaison of the Worcester (MA) Public Schools. Jonathan is a conductor, educator, composer, pianist, singer, author, and consultant for school systems. He has served as the choral director of numerous schools, children’s festival honor choirs, churches, synagogues, and community choral groups. Rappaport has published 18 choral works and 5 books, and is the recipient of awards for his work advocating for the arts in public schools from the MA Music Educators, the MA Alliance for Arts Education, the New England Theatre Conference, and the MA Art Educators Association. He has taught music, trained teachers nationally, presented at national and state conferences in over a dozen states, and directed choruses for 45 years. Charlyn Bethell has been using Kodály Methodology in her Concord Public Schools K-5 classes for 28 years. She has been teaching at the Kodály Music Institute since its inception (1998) and presently teaches Pedagogy and Materials to Level II students in that program. She has given workshops for the Organization of American Kodály Educators, the MA Music Educators Assn, and the Boston Area Kodály Educators. Charlyn is the Music Director of her UU church in Watertown and she is a freelance oboist in the Boston area. She is the adjunct oboe teacher at Phillips Andover Academy and she plays regularly with Solar Winds Quintet and Kaleidoscope Chamber Ensemble. She has performed with Monadnock Music, the Rhode Island Philharmonic, Pro Arte Chamber Orchestra, Emmanuel Music, New Hampshire Symphony, and the Opera Company of Boston. She was a founding member of the New Art Winds (woodwind quintet), which made its New York debut in Carnegie Recital Hall in 1985. She has recorded for CRI. 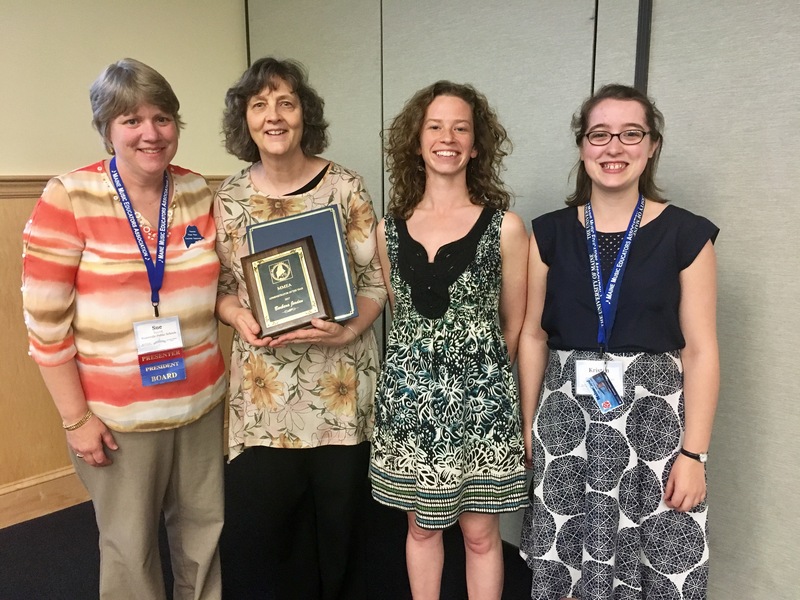 Music teacher and editor Heidi Anderson has created “Maine Motif”, a wonderful magazine for the Maine Music Educators Association. You can access it by CLICKING HERE. After checking it out, let Heidi or president and Maine Arts Leadership Initiative Teacher Leader Sue Barre know what you think. The organization is celebrating their centennial – if not already a member, consider joining. Below is Sue’s back to school message re-printed by permission from Maine Motif. Welcome to a new school year! It is that exciting time, a time of firsts. The first class, the first rehearsal, the first football game. In my household it is the first time I will send one of my children to college. Amidst the firsts there is the familiar: breaking out the pep band folders, singing through a familiar warm up, recognizing a familiar tune. At my house the familiar routine, particularly for my daughter, is the annual school supply and school clothes shopping spree. I challenge you to work to enjoy the firsts. Note how excited those students are in class. Relish the conversation with a senior who is asking for a recommendation or the kindergartener who is so excited to be in your class. For many of us our jobs are getting bigger, the days are seeming longer, and/or some of us (myself included) the hair is becoming more gray. The work you are doing is very important. You are changing lives. You are creating lifelong advocates and consumers of music. You may even be creating lifelong performers. Through this beautiful craft of teaching music we are also teaching the lifelong skills of communication, collegiality, and goal setting to name a few. In each of our schools we can feel like islands, often being the only music teacher. MMEA can be the mainland for you. Take advantage of this publication; take a look at our website. We are working hard to keep the calendars up to date and useful to all. Lastly, help us celebrate our centennial! The events will happen all year long. Beginning with the membership campaign, the first one hundred new or lapsed members (3 years or more lapsed) will only pay $100 for membership fee – saving you $30 (that’s a lot of cups of coffee). To take advantage PRINT the application from the NAfME website and send it and your payment to our executive director Sam Moore-Young. 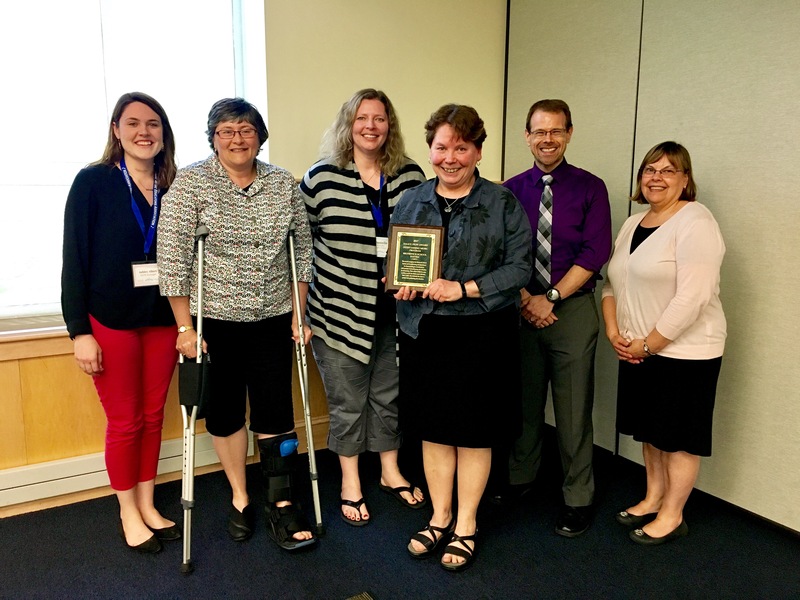 I am grateful to be part of this board and value the opportunity to represent you as music educators of the State of Maine. Please do not hesitate to contact me or any board member, with your questions or concerns. In an effort to make it easier to reach board members we have updated email addresses to align with the position. For example, my new email is mainemmeapresident@gmail.com. Please see the website for an up to date list of emails. Together we are stronger than one, do not hesitate to ask the questions that are on your mind. We are here to serve you, the members of the Maine Music Educators Association.